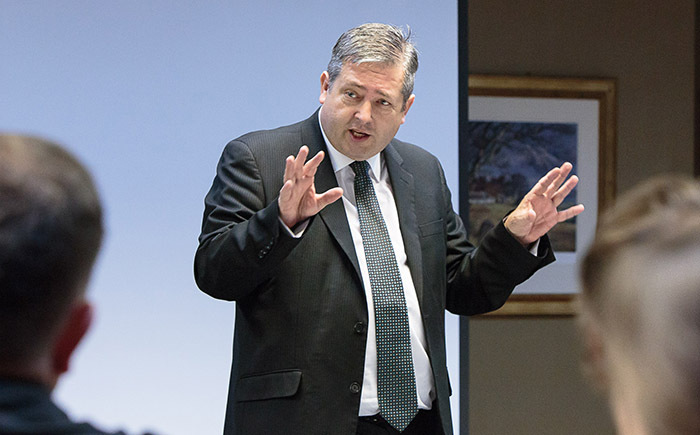 Former Lord Advocate, The Rt Hon Frank Mulholland QC, spoke passionately and for the first time about his tenure as Scotland’s top law officer in a talk to St Andrews Business Club. In the first evening talk of the Club’s new term, The Rt Hon Frank Mulholland QC, Temporary Judge and Privy Councillor, spoke to members, guests and local business people about his career. After graduating from the University of Aberdeen with an LLB in 1981 and a Diploma in Legal Practice in 1982, Mr Mulholland completed his traineeship before being admitted as a solicitor in 1984 and joining the Procurator Fiscal Service. He remained there until 1991, when he was transferred to the Crown Office, working as a solicitor in the High Court Unit. Mr Mulholland became a Notary Public in 1992 and joined the Society of Solicitors in the Supreme Courts of Scotland in 1993. In 1997 he became the first member of the Procurator Fiscal Service to be appointed an Advocate Depute. The same year Mr Mulholland graduated from the University of Edinburgh MBA programme. In 2003 he returned to the ranks of Crown Counsel as the Senior Advocate Depute. In that role Mr Mulholland prosecuted the HM Advocate v Transco plc case – the first prosecution in Scotland of a public limited company for culpable homicide – and represented the Crown in the 2004 appeals by Thomas Campbell and Joe Steele, convicted over the so-called Glasgow Ice Cream Wars. He was appointed a Queens Counsel in 2005. In January 2006, Mr Mulholland was appointed as Area Procurator Fiscal for Lothian and Borders and in 2007 became Solicitor General. In that post he formed the Serious and Organised Crime Division within the Crown Office and led the successful prosecution of Peter Tobin for the 1991 murder of Vicky Hamilton. He joined the Faculty of Advocates by invitation from the Dean in October 2008. Mr Mulholland was appointed Lord Advocate following the 2011 Scottish elections and in July 2011 was appointed to the Privy Council. He stood down as Lord Advocate on June 1 this year and was appointed a Temporary Judge in the High Court and Court of Session on August 28, pending his formal admission as a Senator of the College of Justice on the retirement of an existing senator at the end of October 2016. His talk was listened to with great interest by a gripped and appreciative audience.